May. 11, 2013 8:00 p.m.
Who could resist those eyes! 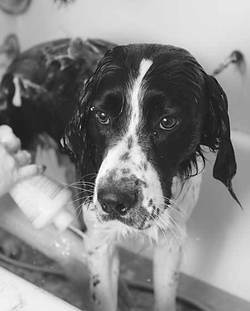 Charlie does not look thrilled about being in the tub for the CLASS fundraising Dog Wash at For Paws over the weekend but if he knew he was helping out other animals that are not being so well taken care of I'm sure he'd have a big grin on his face. CLASS is a not-for-profit organization that is raising funds to go toward the purchase of a facility to house Leduc County's first no-kill animal shelter.